The HydroWorx 2000 Series is a radically functional hydrotherapy pool. This state of the art aquatic therapy equipment boasts a host of high-performance features which represent the cooperative efforts of visionaries, engineers, and clinicians. 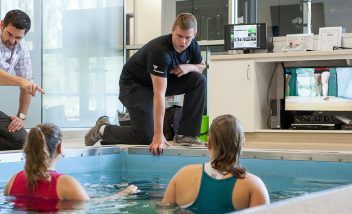 This variable depth pool features a moveable floor, 8’x12′ underwater treadmill, resistance jet technology, and computer and camera systems to satisfy the varied demands of traditional physical rehabilitation, as well as those of dominant, world-class athletes. 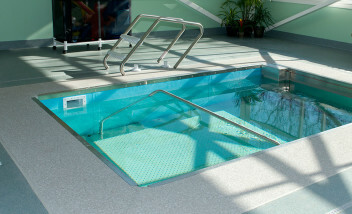 The therapy pool accommodates 1–4 people during treadmill therapy or conditioning sessions. The recommended minimum poolroom dimensions are 17’ wide by 28’ long. This 8’ wide x 12’ long pool is designed to accommodate from 1 to 4 people at once. What are the unique performance features of the HydroWorx 2000 Series pools? 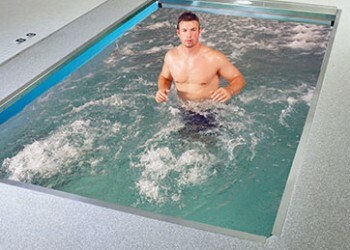 The entire pool floor is fully adjustable in height up to 6 feet allowing patients or athletes to safely enter the water with no ladders or steps to worry about. The entire entry and lowering process takes only 30 seconds. 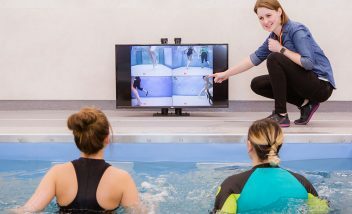 Customize the 2000 Series to include five underwater cameras and a flat screen viewing monitor to greatly enhance a clinician’s diagnostic capabilities when evaluating a subject’s underwater gait pattern. All functions of the HydroWorx 2000 are controlled via a water resistant remote control unit. 9 massage jets are available in a trigger point pattern for a soothing underwater massage. Why are the 2000 Series pools the most advanced therapy and fitness pool in the world? The water-resistant hand-held remote controls all functions of the 2000 Series pools. This gives the athletic trainer or physical therapist complete freedom of movement while administering treatment or conditioning sessions. Who are a few of your 2000 Series customers? 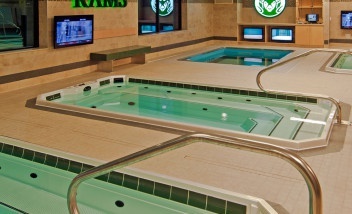 What is an example of how the college & pro sports teams utilize the HydroWorx 2000 Series pools? The HydroWorx 2000 commercial hydrotherapy pool is the result of years of research into the clinical benefits of aquatic therapy for rehabilitation, chronic pain management and conditioning. We have worked with some of the world’s leading research facilities to produce a comprehensive body of clinical evidence supporting our claims about the efficacy of our hydro pools. Visit our research library for more information. The HydroWorx 2000 variable depth pool is particularly useful in assisted living, continuing care and retirement community settings. 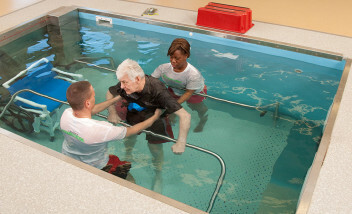 HydroWorx products improve overall health and mobility in older adults. The product also features a movable floor that facilitates safe access without steps or ladders. In addition to offering unmatched usefulness for assisted living environments, the HydroWorx 2000 is also trusted by neurological therapists, pediatric doctors and elite sports clubs around the world. The many features of HydroWorx hydro therapy pools have been proven to treat a wide variety of health conditions and provide unparalleled athletic conditioning as well. A few of our elite clients include the Kennedy Krieger Institute, Children’s Hospital in Minnesota, Manchester United Football Club, the Andrews Institute, and Michael Johnson Performance.